If you are on the look out for some lower costing (under $100 / £100) and especially cheap binoculars (under $50 / £50) and are not too concerned by it's overall dimensions then you are quite often (but not always) better off choosing one with porro prisms rather than those with roof prisms. I say this because whilst the roof prism shape enables a more compact binocular to be produced and higher end roof prism bins are as good as it gets, they do require a number of additional specialised coatings on the prism to equal the performance of a porro prism made from the same quality of glass. To apply these coatings is not cheap and thus at the lower and of the market, roof prism bins either forgo them or use cheaper, lesser quality alternatives. Whilst assuming that the same glass is used, the porro prisms on a cheap pair are essentially the same as those on far more expensive ones and therefore will usually optically outperform cheap roof prisms. It was mostly because of this reason that the LandScout range from Celestron interested me as the series comprises of four low cost porro prism models, which from first impressions all seemed to have all the basics covered and so I decided to arrange to fully test and review a pair and see just how good their cheaper porro prism bins are. As you would expect and primarily due to the form of the prisms, the basic appearance of this Celestron LandScout is consistent with that of most other full sized porro prism bins in that the eyepieces sit closer together than the objectives. 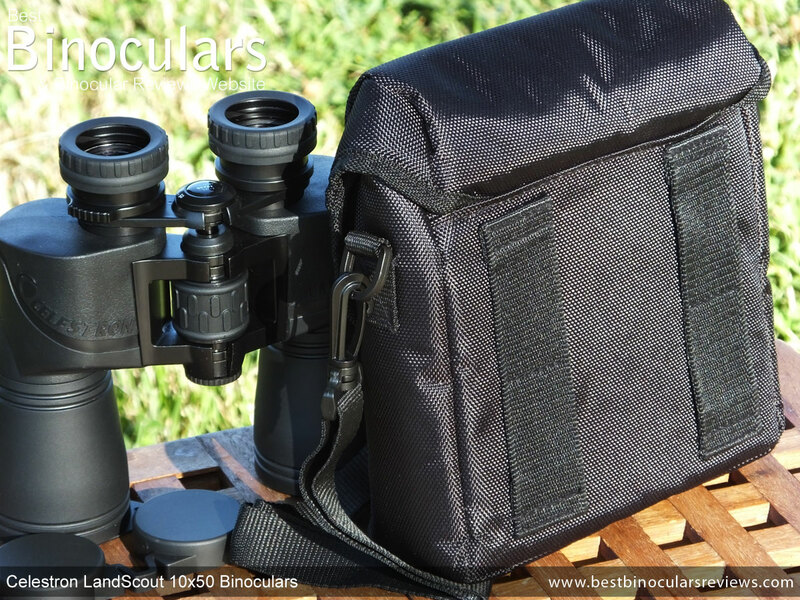 This positive spin off of this and indeed is why this now iconic design has endured is that it most often makes for a very ergonomic, well balanced and thus comfortable binocular to hold. Indeed I found this to be exactly the case on the 10x50 LandScout, the importance of which on a larger heavier, heavier bin like these cannot be understated, especially when using them over longer periods. Like almost all modern binos, these have a rubberized armouring most of the exterior surface. The rubber that Celestron have used is very hard with only a very fine texture making for a surface that offers less grip than those with softer rubber. On the upside, this hard rubber will be far more durable, is easier to clean and does not attract as much dirt and dust as the really soft and tacky ones. This rubber cover is also quite thick, so offers a good amount of protection to the more delicate optics inside, however once again because of the hardness, it perhaps will not cushion any blows quite as effectively as a softer rubber armour. Whilst there are no definite thumb indents on the underside of the body, Celestron have moulded the shape so that your thumbs wrap around the bin very comfortably when held in the correct way and they have also included a number of ridges for extra grip. The two objective lenses are fixed about 9mm in from the ends of each barrel, which means that they are reasonably well protected by the protruding body which will help shield them from potential scratching as well as falling rain and dust. Interestingly Celestron have used an aluminium housing for the LandScout. I say interesting because most bins within this range will have plastic polycarbonate bodies, which are lighter, but not nearly as strong as the more expensive aluminium ones. Being both waterproof as well as fog proof (nitrogen purged), once again this Celestron LandScout performs very well within it's price bracket where it is not always a given that they will be both or even either. Remember having a fully sealed instrument like this is important in many situations and not only when it is wet. For example the seals will also prevent dust from entering the device and which can completely ruin the view. It is also for me an important indicator of quality as most cheap and nasty bins will probably only have a "water protected" or "weather proof" label on them. The central hinge is designed so that as you open and close it, it moves the eyecups further apart or nearer together. In this way you can position them to perfectly match the space between your eyes. 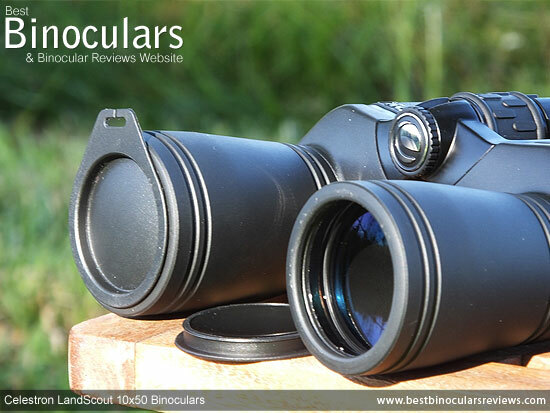 On these Celestron LandScout binoculars, this interpupillary distance (IPD) range goes from 5.6cm up to 7.2cm, which is fairly standard for a full sized bino and thus they should accommodate most adults. You can remove the Celestron logoed dust cap on the front plate of the central hinge by unscrewing it. 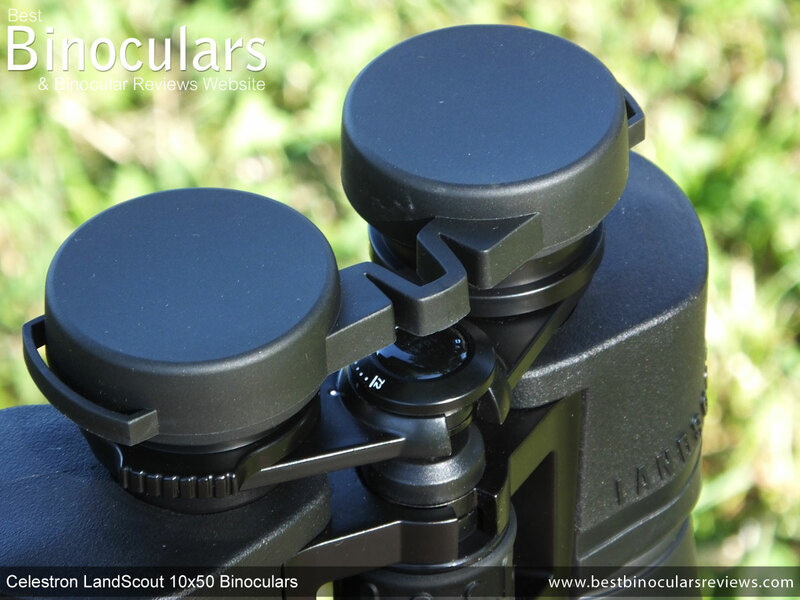 This then exposes a threaded recess that will accept almost any standard tripod adapter designed for binoculars. This then makes it very simple to mount the binocular onto a tripod to get a perfectly stable view. 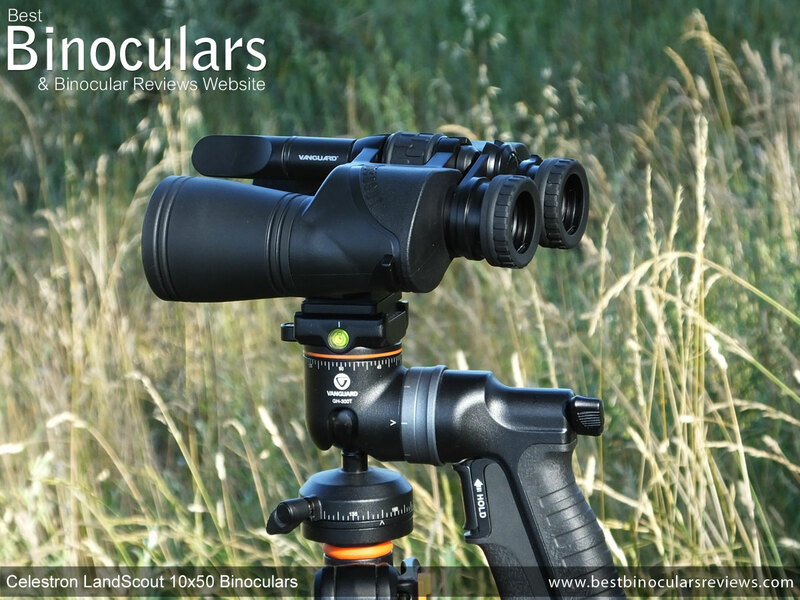 For a binocular of this size and weight, mounting it on a tripod can be very useful, especially if you spend long periods of times in places like hides, ether observing or scanning for birds or other wildlife. It is also a great way to keep your bins hand on your verandah or porch at home. Positioned within the center of the main bridge, the focus wheel has a diameter of approximately 3.3cm and is 2.8cm long. These dimensions make it relatively large, which combined with a rubberized track that runs around it and a smooth action make it easy to reach and turn. When adjusting the focus from one extreme to the other, my sample pair did not have any sticking points along the way, nor was there any unwanted free play or movement. On this Celestron LandScout 10x50 binocular, it takes 1½ turns (540°) of the wheel to move the focus from one extreme to the other. This is what I would describe as a moderately geared focus mechanism, meaning that the balance between making big focus adjustments quickly and being able to accurately make fine adjustments is good. Whilst more aggressive mechanisms that take only a turn or less make big adjustments faster, fine adjustments are a little more tricky. Whilst those that take two or more turns are good for accurate fine focusing, it takes just that bit longer to make the big focus changes. As you would expect, when you turn the focus wheel on these bins and indeed most others, it adjusts the focus simultaneously on both eyepieces which is great. However what if like many people you have differing visual capabilities between your left and right eyes? Well like almost all good bins, these LandScout's have a way of making dioptric corrections and thus permit you to alter the focus setting on one eyepiece independently of the other. 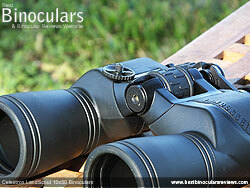 In this way you can compensate for any differences in your eyesight when you first set up the binoculars. For more on this please refer to my guide on how to How to Calibrate & Focus Binoculars. 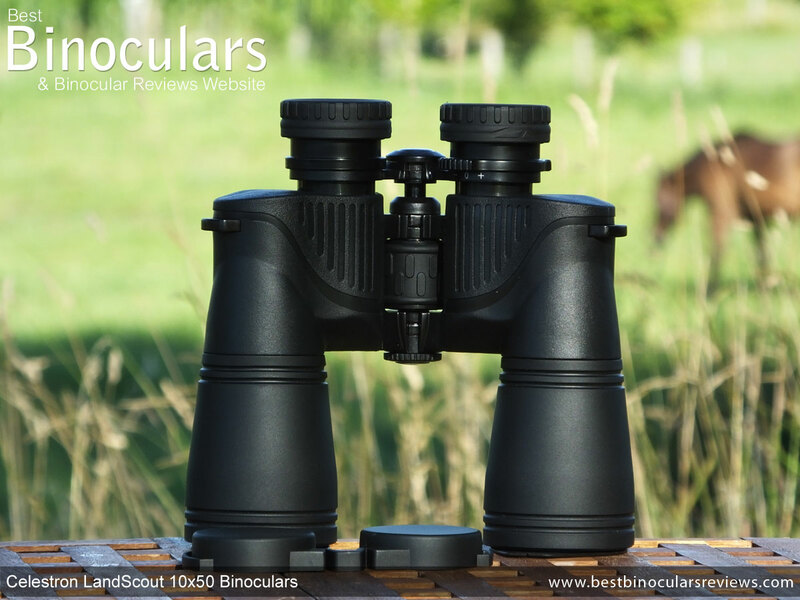 On these Celestron 10x50 LandScout binoculars, the Diopter Adjuster comes in the form of a ring, has a range of ±4 and is positioned on the right eyepiece, just under the eyecup. On my sample, it turned smoothly and whilst there was a little friction, I thought it was just a little too easy to move, which combined with it being quite exposed can make accidental movement of it quite easy. Some instruments have diopter adjusters that are lockable (not usually in this price range though) and thus prevent this problem, however this is not a major problem if your setting is neutral, or if you mark your setting on the body as you can quickly return it to the correct spot without having to re-calibrate, but for some this could be a little annoying. Firstly I really like the fact that they have used twist-up eyecups. So many cheaper binoculars, especially porro prism ones come with rubber fold up/down cups, which can be comfortable, but usually don't offer enough stability or anyway of being able to accurately adjust them should you require a slightly different than normal setting. The twist up/down mechanism on each eyepiece was nice and smooth on my sample pair and I like the way it actively clicks into the fully extended/retracted and mid way positions and whilst there was a little free play it was very minimal and in no way affects the stability or accuracy of the eyecup setting. Nice and large with an external diameter of 45mm, each eyecup has a rubber covering, which in most cases will make them more comfortable. However this rubber covering also has a hard ridged track running around them which is there to make adjustment easier, but I found the jagged edges of them dug into the top of my nose and around my eyebrow area and at times was anything but comfortable. I think if I was to keep these bins, I personally would take a sharp knife and just round off these edges, which I am sure would make all the difference. At 17.9mm, the amount of eye-relief on these is very good and even though they just miss out making it onto my list of Long Eye Relief Binoculars (by 0.1mm!!) they should still easily have enough room to accommodate eyeglass wearers so that they can get the full field of view with their glasses on by twisting down the cups. 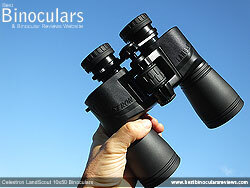 Celestron advertise their length as being 6.69in / 17cm, which is correct with their lens covers removed, the eyecups retracted and the focus setting adjusted so that the eyepieces are closest to the body. Likewise their official width is stated as being 7.75in / 19.7cm, which is taken with the central hinge fully open, close this and their width can be reduced to 16.7cm. Their height of 2.44in / 6.2cm is also taken with the hinge open. Close this and this measurement moves out to around 8cm. As you can see from the table below their dimensions compare quite favourably against other 50mm porro prism bins. However as you can see when compared to an average 50mm roof prism binocular, these are quite a lot wider. This is to be expected because of the objective lenses sitting further apart than the eyepieces. One one hand this is one of the downsides to a porro prism versus the roof prism. However if dimensions are not to important to you, one of the benefits of having the objective lenses further apart is that you get a slightly better stereoscopic image, which in turn can deliver a better sense of depth in the view. For interest, I have also included the dimensions (and weight) of a 42mm binocular below, because as I stated in the beginning, I thought that these may offer a good low cost option to a "standard" sized mid level binocular for some people. Their advertised weight of 33.3ozs / 944g is about spot on to what I measured my pair as being without lens covers or the neck strap attached (940g). By adding lens covers their weight became 974g and with the neck-strap 1024g. 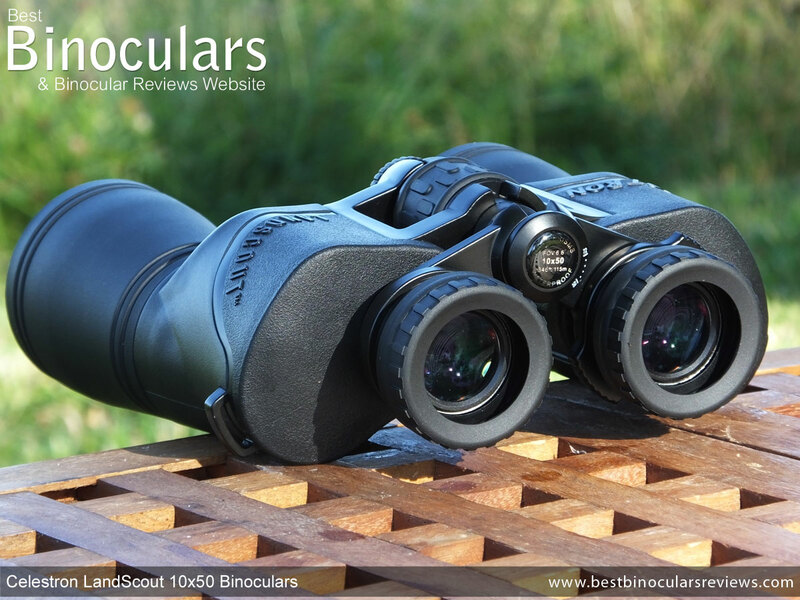 Whilst I would never describe them as being lightweight, once again as is demonstrated in the table above, they compare favourably to other similar 50mm porro prism binoculars, but are a little heavier than most 50mm roof prism bins and quite a lot heavier than your average 42mm binocular. No details are supplied by Celestron as to the exact makeup of the lenses that make up the eyepiece, so I can't comment, except to say that at 22mm in diameter, they are reasonably large for a full sized bin. Once more, no information is given regarding the composition of the compound objective lenses. However having a diameter of 50mm, which is a fair bit larger than your most common 42mm binocular, I would like to go over some of the potential benefits and indeed the ramifications of this. Obviously the larger size makes for a bigger, heavier instrument and potentially adds a fraction to the cost. On the plus side, the larger surface area enables more light to be captured, which in turn can equate to a brighter and better quality image being produced. As to whether this actually delivers on their potential obviously also depends on many other factors like the quality of the glass used, it's coatings and the expertise and exactness of the optical pathway. However if we assume that we are comparing them to other equal quality binos, we can take the size of the exit-pupil to be a good indicator to their low light performance. These have an exit pupil of 5mm (50 ÷ 10 = 5), which means the shaft of light exiting each eyepiece has a diameter of 5mm. If we compare this to a 10x42 binocular that has a 4.2mm exit pupil (42 ÷ 10 = 4.2), we can see that they should seem to be brighter in bad light when the pupils in your eyes have dilated and the amount of light being delivered to them by the binocular becomes a limiting factor. The other benefit of a larger exit pupil is that it simply makes it easier for you to line up your eyes with the shaft of light and thus makes them easier and quicker to use without any dark rings becoming visible on the edges of the view. In order to correct the inverted image after it passes through the objective lenses, most binos use a prism which are either of a porro or roof design. Their design means that they do not require any specialized coatings to produce the same quality of image as that of a roof prism, this means that they are far cheaper to produce and still deliver the same quality of image as that of roof prisms. In a low cost instrument like these Celestron LandScout binoculars, this is vitally important as to save costs many cheap roof prism bins will often either not use these coatings or use inferior materials and thus deliver a lower quality and less bright image. The second benefit is that they can produce a better stereoscopic image with an improved sense of depth and perspective due to them having their objective lenses farther apart than most roof prism bins. Celestron advertise that their prisms are made from BaK-4 glass, which is good as many bins in this price range will use the cheaper BK-7 glass, which is not always bad, but is often not best used for binoculars as it has a lower refractive index and so cannot bend the light as steeply. The result is that BK-7 bins often display vignetting at the edge of the exit pupil. With the aim of making sure that as much light as possible gets transmitted in exactly the right way through the optical system and then on and into your eyes, manufacturers add single or multiple coatings of an anti-reflection coatings to some or all of the glass surfaces in the device. These coatings can make a big difference to both the calibre and brightness of the final image and so are really important. 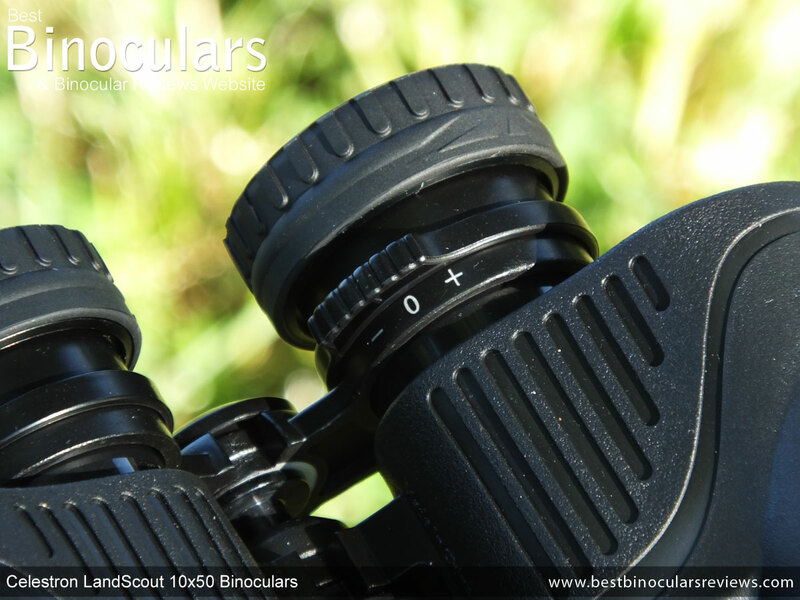 To save costs, some will only add a single coating to some of the surfaces and are referred to as coated optics, this is fairly common on cheap binoculars. An improvement are those that are multi-coated, which have multiple layers on some surfaces (usually the first and last on the lenses) and is what I often see within this price category. So to discover that these Celestron LandScout 10x50 binoculars have been Fully Multi-Coated is excellent as it tells us that every glass surface throughout the optical system has had multiple coatings of anti-reflection material added to them. 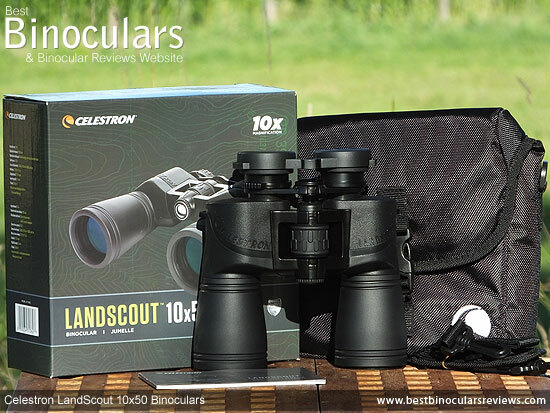 These Celestron 10x50 LandScout binoculars are described as having a 6.6° angular field of view, which can also be expressed as being 346 feet wide at a distance of 1000 yards away (115 meters at 1,000 meters). Compared to other full sized 10x binoculars this very good and beats almost all others that I have used. The advantages of a wide FOV are many, but essentially the more you can see at once without having to move the view makes it easier to quickly locate targets, follow moving ones and scan large areas when looking for something. 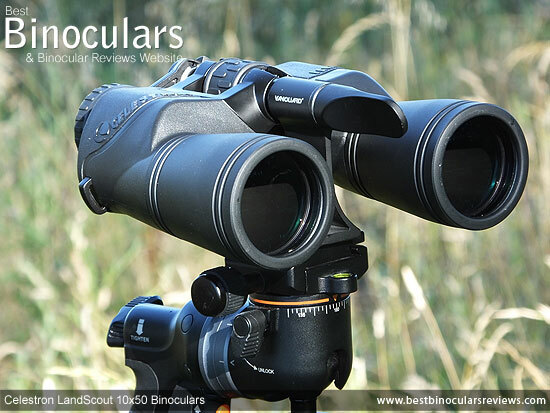 At 22.9ft (7 meters), the minimum focus distance on these and indeed most other similar binoculars is poor when compared to most standard bins, especially those that use roof prisms. I consider anything at around 6ft to be excellent and some get much closer than that. So it is for this reason I would never recommend these to anyone who like to use their bins for the close observation of things like flowers, insects or even birds. The 17.9mm of eye-relief is excellent. This combined with their twist-up eyecups makes them a good choice for most eyeglass wearers. In an effort to keep my opinions on the views through the bins that I review consistent, I usually compare the image of the binocular under test with that of a similar "benchmark" bin of my own. I thought that both the color reproduction and the degree of contrast in the image that these Celestron binoculars deliver looks neutral, but without being spectacular. For the most part this is a good thing as they lack any sort of tinting, be that intentional as is the case on some bins that use a tinge to highlight certain colors in the case of some specialist hunting binoculars or more often unintentionally where cheaper glass is used and you can sometimes observe a brown/yellowish hue to the image. The combination of large 50mm objective lenses, decent quality glass that is fully multi-coated has paid off on these bins and I would say that in good as well as in poor light they looked every bit as bright as my mid-level 10x42's that cost almost 3x as much as these do. However it must be said that comparing them to my top of the range 10x42's there was a difference in brightness, but considering that they cost 10x as much and have the very best quality glass and coatings available, this is perfectly understandable. So as expected, with their large 5mm exit-pupil and fully multi-coated optics combine well, enabling these to offer a good low light performance that I believe will outperform most 10x42 bins of a similar price level. The whole image right across the field of view, to me looked to be nice and flat and I could not observe any obvious distortions that cause the image to curve either outwards (barreling) or inwards (pincushioning). There is a small amount of softening of the image right at the outside limit of the view, however this is no more than I would expect to see on a binocular at this or even one level above, so it really is nothing to worry about. Indeed if you factor in their wide field of view and the flatness of the image this is really impressive. Perhaps the weakest aspect of the view is the level of color fringing as the result of chromatic aberrations. To be fair this thin blue/purple/yellow halo only becomes apparent when you study the edges of an object that is emphasized because it contrasts with it's background and whilst the amount was more than what I could see through my controls, it is some ways expected as my controls have special ED glass elements specifically designed to reduce these aberrations. Thus I would like to stress that whilst it is present under the right circumstances, the amount is minimal and at an extent that is no worse than what I would expect to see in this class. It comes with it's own shoulder strap that can be attached or removed from the bag via the quick release swivel clips on the ends of it. Whilst the strap is not padded, it does have a small shoulder pad that you can slide along the strap to place in the correct position for added comfort when carrying. The rear face of the bag has four belt loops sewn into it, which means you can remove the shoulder strap and then carry it on your waist should you wish. A flap that folds over the top of the case and which when opened gives you access to the interior. It is held closed with a quick release clip, which can be adjusted for length and when closed is secure. Inside the amount of padding is good and whilst this type of case is never going to be as protective as a rigid one, it is better than many soft cases, especially at this price level. The binoculars fit snugly into the bag, but with still enough room to easily close the lid with the eye-cups fully extended. Inside and on the underside of the lid is a separate meshed pocket that can be closed with a Zip and which is a good place to keep a few items for cleaning your bins etc. These Celestron LandScout binoculars do come with a neck strap included, however my sample was missing it's strap and was probably not replaced by the previous journalist to use them! 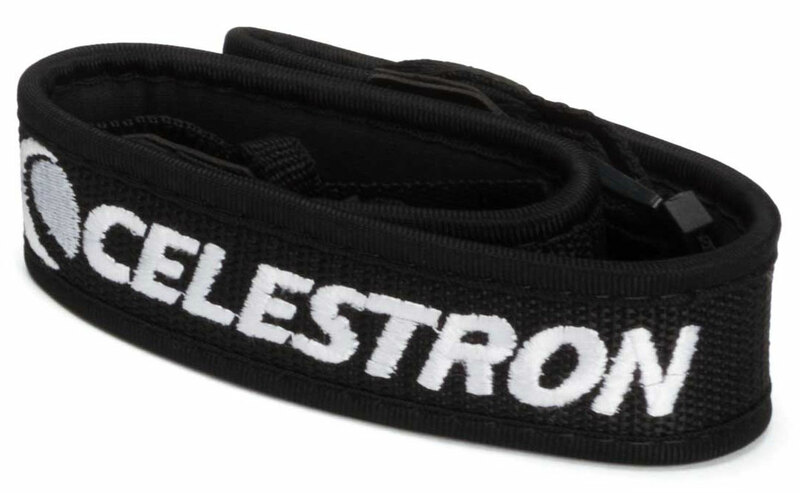 This unfortunately means I cannot comment too much, but from the supplied image, the strap looks similar to many of the others that Celestron use on their other similar priced binoculars. If so, this means they are about what I would expect to find on a bin at this price point and whilst they will do the intended job just fine, are well padded ad thus should be comfortable, they are understandably not quite as luxurious as those you get with more expensive products. 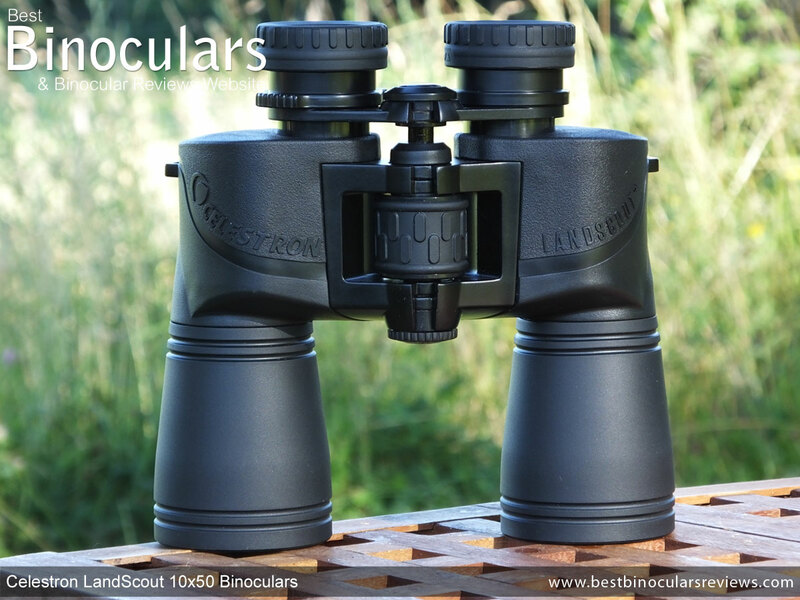 The thin plastic objective lens covers supplied with these Celestron LandScout binoculars are fairly basic, however they do fit well into the ends of the barrels and thus should not easily come away unintentionally and they do a good job of keeping the lenses clean and protected when you are not using the bins. They however are not directly tethered to the bin like many others that you find these days, which is a shame as it means you need to put them somewhere safe every time you take them off to use the bins and remember where they are every time you want to replace them. The do each have an open loop on them, which I guess means that you can attach them to your neck strap for safe keeping, but this is not an ideal solution. The soft rubber rain guard is good. Once attached, their grip over the eyecups is secure and thus they wont easily come away when you don't want them to, but are not too tight as to make them difficult to take off when you do. They have a flexible bridge in between the two cups which takes up the slack when you close or open the central pivot on the bins and which means you can fix them to your eyecups no matter what your IPD setting is. This believe it or not is something that not all manufacturers think of. It also has a couple of loops (one on each cup), meaning that you can attach it to your neck-strap should you wish. You also get a rather basic cleaning cloth included. For me the quality of this is sufficient for use on the body and perhaps the very occasional use on the lenses if for instance when you are out in the field and have no better alternatives. With some costing less than $10 / £13, my advice is to always invest in a specialist optical cleaning kit, that will enable you to take care of your lenses and keep them perfectly clean without fear of damaging the coatings. The small LandScout instruction manual is typical in that it contains all the basic information needed, which includes the parts of the binocular, adjusting the interpupillary distance, setting the diopter, focusing, eyecup adjustment, tripod adaptability, cleaning as well as care and storage. 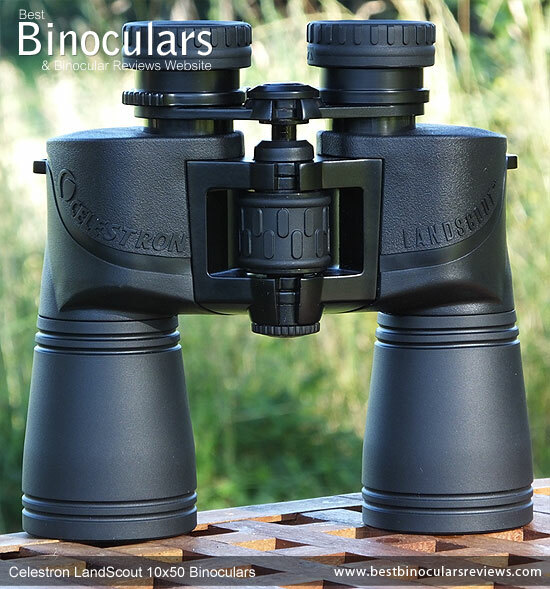 At the end of the booklet there is a section that offers information on servicing and repairing your Celestron LandScout binoculars as well as details of the Celestron Limited Lifetime Warranty. What is most interesting to me is that whilst these are the cheapest, the compete very well in almost all areas, especially when compared to the other porro prism 10x50's. The better 10x50 roof prism bins often tend to cost more, which is largely down to them needing expensive phase correction and highly reflective coatings on the prisms as well as the fact that they often use ED glass in their lenses with the aim of reducing the amount of color fringing seen in the image. Strong Points: Whilst not the lightest pair of bins I have ever used, they feel very comfortable to hold and are well balanced which really helps on bigger larger instruments like this. Considering their price the use of an aluminium body that is both water and fog proof as well as twist-up eyecups is very impressive as almost all of their direct competition will only have either a plastic polycarbonate shell, fold down eyecups and possibly only be weather protected. Likewise with the optics, at this price I would not always expect to see fully multi-coated optics AND the use of BaK-4 glass for the prisms. This in conjunction with the large 50mm objectives does make for a bright image and a 10x binocular that really excels in low light. The amount of eye-relief is excellent and once again when you combine this with the adjustable twit-up eyecups, it make them a super option for those who wear glasses. 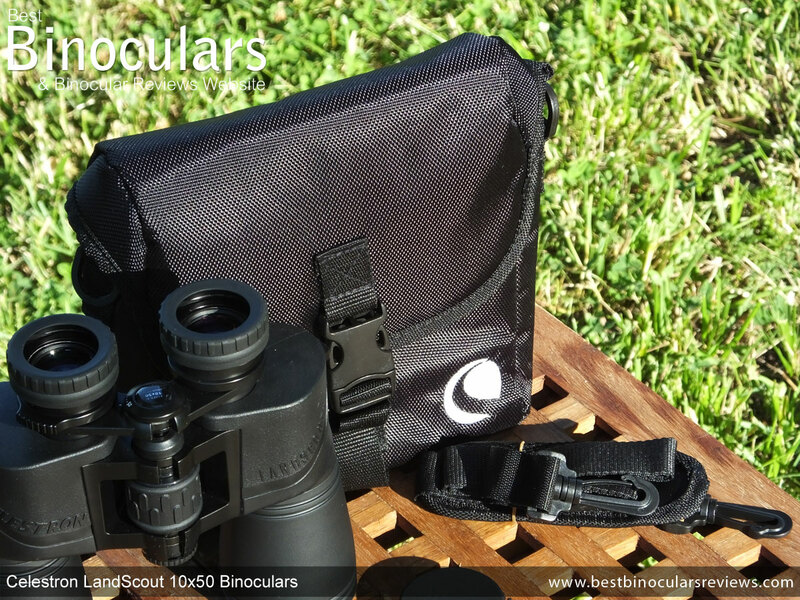 Most impressive is their class leading field of view that is indeed wider than just about any other larger 10x binocular that I have used. However a wide view is no good if it is blurry at the edges and that was in no way the case on these Celestron binoculars. Indeed I thought the image remained both sharp and flat right across the view with only a small amount of softening right at the edges which is more than acceptable for a bin at this or even higher price points. Weak points? To keep the price to such a low level, Celestron have obviously had to make compromises somewhere and for me one of these areas is the accessories. Don't get me wrong, none of them are bad and all work as they should and indeed are in most cases about as good as it gets at this price range. But they are not quite up to the level as that of the actual binocular itself. In some ways this is a shame that they are not just a little more polished, but it is also understandable and to be honest, I would much rather have basic lens covers and good quality optics, than it being the other way around. Whilst the twist-up eyecups are a welcome surprise at this price, the jagged, sharp edged rubber cover on them is not and it makes them somewhat uncomfortable when you push the bins firmly against your face. Luckily there is an easy fix to this as it would be quite simple to take a sharp knife and just round off the edges, but you really should not have to. Another very tiny gripe is the diopter adjustment wheel that is so exposed, which makes it quite simple to be moved by accident. This is not really a problem if like me your setting is neutral as it is easy to return to that point. If it is not and does not happen to be positioned on one of the few markers, I would advise making your own mark with a permanent pen or sharp knife to make it simple to return without having to re-calibrate. 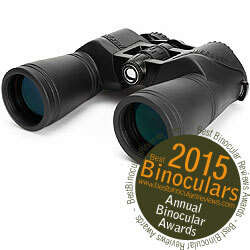 To sum up, at this price I think the Celestron LandScout 10x50 binocular is great value at it's selling price. Not only is it better made using better components than I had expected, but the image standard is better as well. Going back to my initial reason for choosing the 10x50 version to review as I wanted to see if these could make for a cheaper alternative to a mid-range 10x42 roof prism bin. The answer is not completely clear cut and will depend on your priorities. Because that section of the market is so competitive, many mid-range 10x42 binoculars ($130 - $300 / £130 - £300) have become very good and nowadays more will have features like ED glass lenses and thus the better ones (usually those that cost between $250 and $300) are really good at minimizing color fringing. 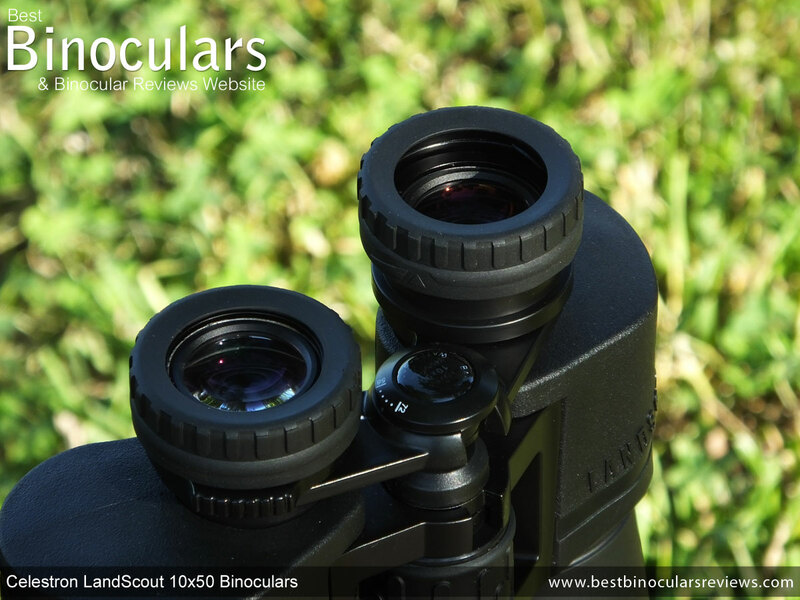 So if you really are not worried about weight and size and can live with a tiny bit more color fringing that what I see on the best mid-level 10x42's then yes, you can save some cash and get a binocular that has a great low light performance and wide field of view. 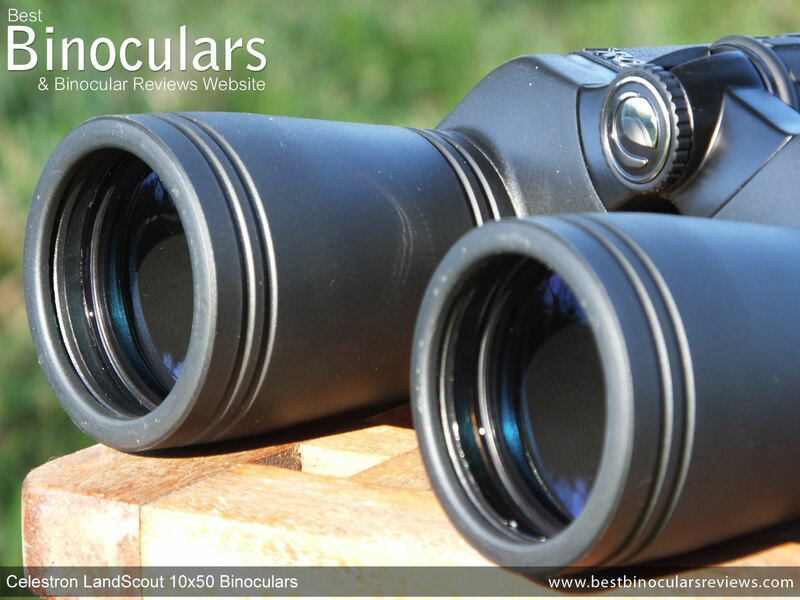 If you combine their strengths: A wide view for a 10x binocular, with a good quality view, excellent low light performance and tough waterproof housing, you have all the elements for an instrument that will shine in all weather conditions that makes it easier to scan distant hills or open waters looking for something or indeed quickly locate and follow small fast moving objects at closer ranges. Thus if we also factor in their size and weight, I could see these really being of use to bird and wildlife observers or especially hunters who perhaps need to cover large areas of terrain in search of game but who perhaps do not spend all day hiking through difficult terrain. Thus they are perfect in any hide or taking with on your vehicle. This is not to say you can't carry them, but if you also carry a lot of other equipment as well (like hunters or photographers) you may be better off sacrificing a little low light performance and choosing a more compact option. 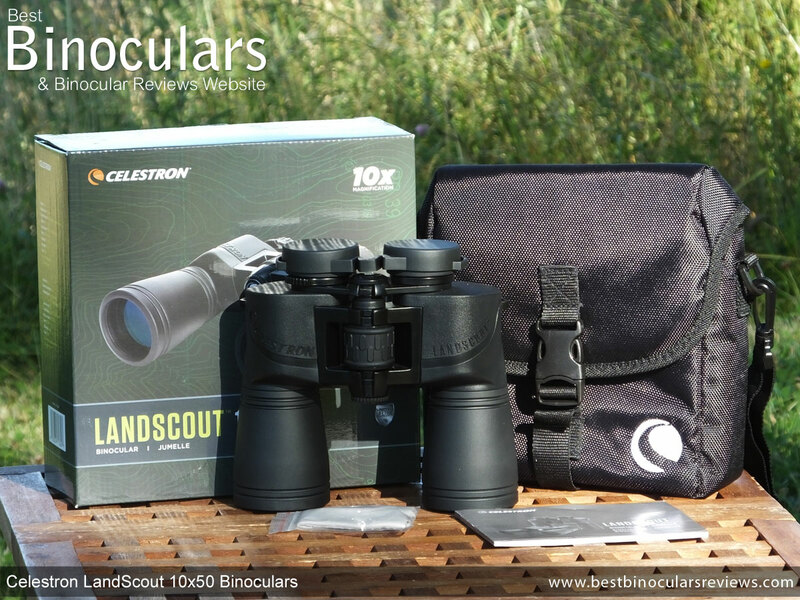 People with houses that look out onto the ocean or even just a long garden that attracts birds could do far worse than having a pair of these Celestron LandScout 10x50 binoculars handy all the times. You could even mount them onto a tripod permanently on the balcony making them even more accessible should something catch your eye. I would like to quickly make a point to stress that this review contains my truthful opinions of these Celestron 10x50 LandScout Binoculars that I formed after methodically and carefully researching, testing and then using them. I would also like to make it clear that unlike many so called "reviewers", I am in now way reimbursed by any supplier, dealer or manufacturers to write in a certain way or with any sort of bias. However no matter how careful I am, I do make the occasional mistake (in the case of spelling perhaps more than occasional! ), so please if you spot any errors or omissions, please feel free to contact me so that they can be corrected.